It might be nice to live in a world where the mere fact that you are male or female does not attract attention to you within your profession. But while we are waiting for that day, you might like to ask yourself about women in systematics. David Archibald suggests that the tree produced by Anna Maria Redfield is "the first tree – creationist or evolutionary – by a woman and may well be the only such tree by a woman until well into the twentieth century." 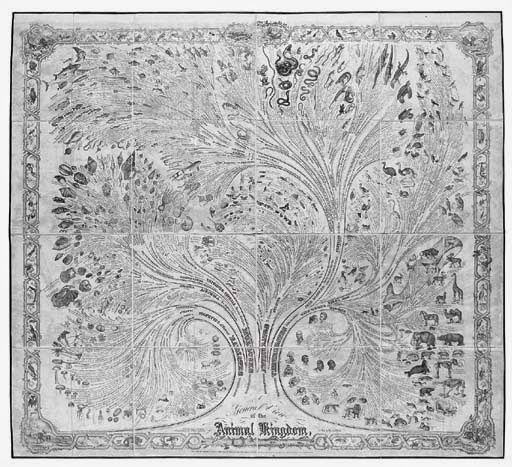 The tree-like diagram (shown in miniature above) was a wall chart (1.56 x 1.56 m) called A General View of the Animal Kingdom, published in 1857 by E.B. and E.C. Kellogg, New York. It is heavily illustrated with images of the taxa, their names, and brief notes: eg. "Man alone can articulate sounds, and is capable of improving his faculties or advancing his condition". Only three lithograph copies of the original tree are now known, one of which was sold at auction by Christie's in 2005 for £7,200. The following year the same publishers produced a companion volume to the chart, called Zoölogical Science, or Nature in Living Forms: Adapted to Elucidate the Chart of the Animal Kingdom, and designed for the higher seminaries, common schools, libraries, and the family circle (1858, reprinted 1860, 1865, 1874). A copy is available in the Biodiversity Heritage Library. Only 57 original copies of the book are now known. This book of 743 pages is richly illustrated, the artist being unacknowledged in the first edition but credited as E.D. Maltbie from then on. (He is presumably responsible for the chart as well.) The book has the frontispiece shown below, which is an edited version of the base of the tree. The wall chart is a masterpiece, with intricate and accurate illustrations of representatives of the animal kingdom portrayed as a Tree of Life, which illuminates the relationships of the major groups of organisms. It is an important document in the study of biology and in the pioneering work of women in science. The wall chart has eloquent phrases, which express a Victorian humanistic view of nature (often intermingled with anthropomorphism, biblical overtones, and the biological superiority of humans). There is no evidence whatever that one species has succeeded, or been the result of transmutation of a former species. Butts notes that unfortunately Redfield "remains a relatively minor and poorly recorded figure in the history of women in science, let alone biological and evolution studies in general." How can I get a poster copy of the wall chart? I've looked everywhere online! SAME! this would be the perfect gift for my sister! I am also looking for a reprint. I saw a framed litho in Marin last week. Not for sale.